Keith Giffen and J.M. DeMatteis ramp up wild and wacky to its highest degree in Justice League 3001 Vol. 1: Deja Vu All Over Again, the fourth volume in their 3000/3001 saga. The writers manage to populate their 31st century with an almost absurd (probably purposefully) number of current DC Comics characters, from A-list and B-list Justice Leaguers all the way through more esoteric characters from deep in the DC mythos. Thus far, the 3000 books have struggled somewhat to balance Justice League action with the writers' trademark bicker-talk, not always successfully; with Deja Vu, the book gives itself over talking, often eschewing the action entirely, and it improves the tone overall. By this point 3001's got a pretty large cast, and it begins to feel like familiar, comfortable territory for Giffen especially, who juggled large casts in his well-regarded Legion of Super-Heroes runs with aplomb. Unpredictable and irreverent, the first volume of Justice League 3001 is a curious beast, and I'm interested to see the heavy lifting Giffen and DeMatteis will have to do to bring this all together with the last volume. In the first issue of Justice League 3001 (collected after the final issues of 3000), Giffen and DeMatteis have artist Howard Porter depicting the Legion of Super-Heroes dead in the background of a battle with Starro, just as the Justice League 3001 arrives. Obviously there's no reason to get too worked up about "Giffen kills the Legion!" since outlandishness here was certainly the point. But despite that 3001 will be over with the next volume, this marks a strong statement of 3001's (supposed or intended) longevity, that the Justice League is here and the Legion is gone and not coming back. At the same time, if Justice League 3000, especially in its second volume, eventually revealed itself to be fairly akin to Giffen and DeMatteis's Justice League International, Deja Vu is very reminiscent of Giffen's Legion of Super-Heroes. The book has a cast now that includes Superman, two Batmen, Wonder Woman, two Flashes, two Green Lanterns, Fire, Ice, Booster Gold, Blue Beetle, Firestorm, Supergirl, Etrigan the Demon, Darkseid's head, an evil Lois Lane, a futuristic Harley Quinn, and Turtle Boy Jimmy Olsen, among others, and the reader can't be guaranteed of seeing all of them every issue (Booster and Beetle, specifically, are off-camera perhaps too much). The strong use of Jack Kirby properties, too, both Etrigan, Darkseid, and also characters like Kamandi, the Last Boy on Earth, seems like a nod to Paul Levitz and Giffen's selfsame use of the Fourth World in Legion of Super-Heroes: The Great Darkness Saga. Albeit the two final issues of 3000 collected here aren't battles royal (the second is, but the first is a catch-up with Ice since the present day), but again action gives way significantly to conversation once 3001 begins. 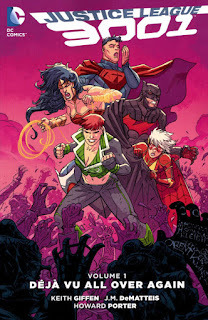 The first issue is all conversation, on the battlefield, and the third is a succession of character pairings -- Superman and Batman, Lois-Lane-disguised-as-Ariel-Masters and Ronald (former Justice League International sidekick L-Ron), Guy Gardner and Wonder Woman, Flash Teri Magnus and Supergirl. Eighteen total issues in, the character relationships have perhaps progressed far enough that the original bicker-talk has given way to something deeper, but additionally in taking this tack 3001 becomes much more interesting. There's no lack of super-team action books on the shelves, and one where the characters spend an issue talking over drinks instead immediately stands out. Deja Vu takes a giant step toward better establishing 3001's continuity, but that doesn't make things any less confusing. At the end of 3000, Ice recounts the events of Giffen and DeMatteis's miniseries I Can't Believe It's Not the Justice League, though the events that follow differ from what actually followed in terms of Ice's resurrection in Bird of Prey, her reunion with Fire in Checkmate, etc. There is, at least, a jumping off point. What follows involves Kamandi and the Atomic Knights, leapfrogging entirely the Legion of Super-Heroes until arriving at Ice's appearance in 3000. We can't say the writers didn't give us answers, but they're far from conclusive. Indeed, there's no lack of storylines to wrap up in the final volume. Etrigan has Darkseid's head in a glass case in his castle, for one thing (a series of words I never thought I'd type); for another, Lois Lane has L-Ron for some reason, renamed Ronald, but his L-Ron personality threatens to re-emerge (additionally, the mystery of why Lois Lane wants to kill Superman anyway). It's hard to some extent to determine what Giffen and DeMatteis intend to be a mystery and when they're just fooling around, as with why there's a Jimmy Olsen Turtle Boy or the significance of Kamandi finally learning to say Ice Tora Olafsdotter's name. Justice League 3001 Vol. 1: Deja Vu All Over Again reaches its peak absurdity in the last chapter, as Batman and Supergirl fight a pair of droll robo-aliens alongside a future-Batman, who turns out to be a fifteen-year-old girl. Tina Sung is beyond annoying, a nagging character akin to Giffen's Fifty Sue in New 52: Futures End. But, in what I also believe to be indicative of Giffen's style, this heightened comedy belies a gruesome, shocking end to this story. Death is hardly an absolute in Justice League 3001, though there aren't that many issues left to bring a character back; again, I'm eager to see how the finale ties all of this together.